Tonight and every night, Cabaret Économique requires artificial intelligence, band of idols, a darkroom, and the fact of cannibal sirens. Special thanks to: Adam Harrison, Monika Szewczyk and Till Wiedeck. Tableau Économique, 2019, Leisure Mode, Photo by Anna Shteynshleyger. 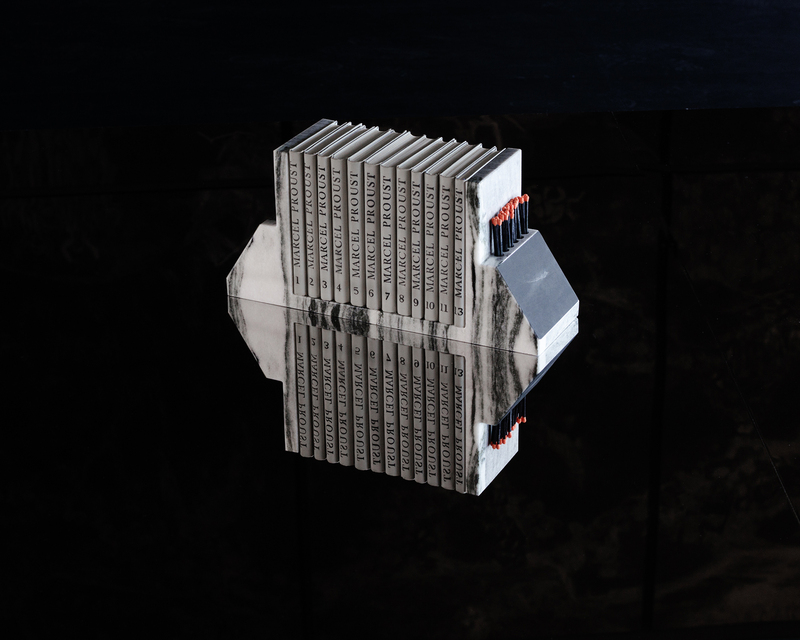 From February 16 to May 12, 2019, Yugoexport's Tableau Économique transacts live from VCU ICA. The tableau has two modes: leisure and labor. At leisure the tableau rests, sleeps and rejuvenates. In labor mode the tableau may be contacted for transactions, either in person or online via phone and web. 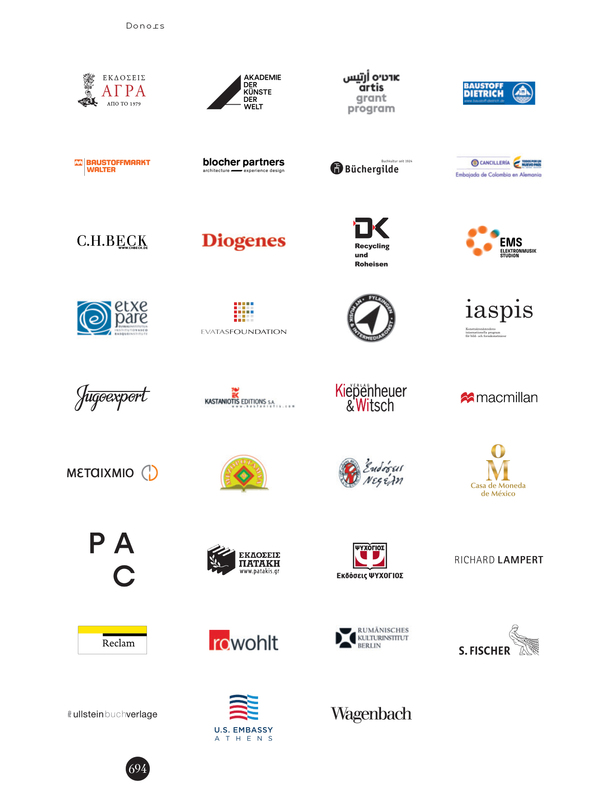 documenta 14 Donors. The documenta 14 Reader, 694. 2017. Munich, London, New York: Prestel Verlag. The import-export business of making history demands an equivalence, a loyalty, and a familial solidarity between people and things. Such skills are best honed in conditions of blindness, where we cannot immediately tell what is in the room with us and whether it is alive or dead. Yugoexport is a blind, non-aligned, oral corporation modeled after the self-managed, autonomous, unofficial organizations and experimental clubs within the larger state infrastructure of the former Yugoslavia. Incorporated in the United States (where corporations are people), launched in Paris and headquartered in Belgrade, she is a copy or an avatar of Jugoeksport, a defunct Yugoslav apparel manufacturer and weapons exporter. Since the dissolution of Yugoslavia in 2003, ‘Yug’ is a vacant space, and Yugoexport occupies it by returning to the original meaning of yug or jug which is south. The oral corporation mounts production on sur-national scale from this cardinal direction, from the Balkans and the old Roman trade and military route, the Via Militaris. Yugoexport’s process of in-corporation continues. Seductive Exacting Realism, Transactional Area, Waiting Room, Kassel, 2017. Photo by Anna Shteynshleyger. Yugoexport Articles of In-Corporation are etched into two horizontal marble steles: in Serbian as filed in Belgrade, Serbia; and in English, as filed in Chicago, USA. Wherever the steles are exhibited, visitors may produce graphite rubbings for a fee. The rubbings are numbered, certified and signed. The stele, mounted on two tables, were first presented in the Transactional Area of SER at documenta 14 in Kassel. In Athens, one storefront in Stoa tou Vivliou book arcade hosted one reproduction of the documents. Every Friday at dusk, a member of the Army of Beautiful Women would appear and read aloud from the in-corporation documents demonstrating the full use of this oral corporation’s principles. In classical Athens, all tributes and laws were written on papyrus and filed in the Agora. Copies of these documents were inscribed into marble steles and placed throughout the city-state, orated once weekly for the citizens of Athens. For ancient Greeks, marble had the status of a copy. Yugoexport Articles In-Corporation exist only as reproductions in the form of steles, rubbings and orations. 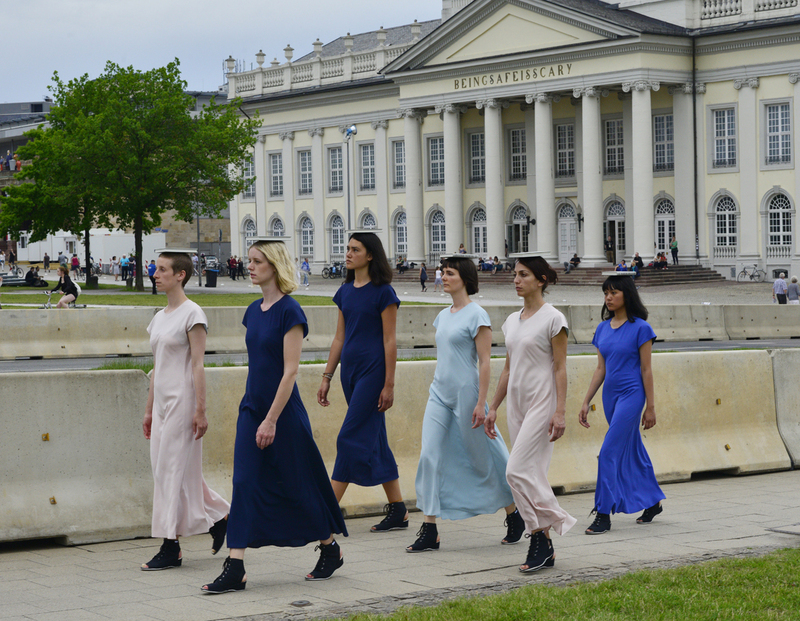 Spinal Discipline: Julia Allnoch, Isabella Artadi, Mustafa Boğa, Annika Katja Boll, Beryl Chepkirui, Mona Eing , Ozgür Genc, Mila Gligorić, Josefine Mundri, Andara Shastika, Wenti Sheng and Alma Weber working, Kassel, 2017. Photo by Anna Shteynshleyger. This posture is fashioned by the Yugoform, composed of the Borosana labor shoe, providing the wearer with nine hours of comfortable standing, the ABW (Army of Beautiful Women) patterns #2 and #3 dress, a garment enhanced by strolling, and the book Seductive Exacting Realism by Marcel Proust 12. Up to twelve participants–Sirens–wearing the Yugoform demonstrate a minimal but precise choreography, carrying books atop their heads. Spinal Discipline demonstrates freedom of movement against immobilization caused by fear, waiting and wasting to death. The Sirens, an elite force within the Army of Beautiful Women, move together with poise and comfort, making the cities into catwalks and assembly lines. Marble, striking paper, matches, Marcel Proust’s Complete Works Vol 1-13 (Zagreb: Zora, 1965). Photo by Anna Shteynshleyger. A 13-volume set of Marcel Proust’s collected works was published in Yugoslavia in 1967. This edition, in the Latin alphabet, was highly valued by Yugoslav intelligentsia for its elegant translation from French by the poet Tin Ujević. During the Bosnian civil war, these Proust sets fetched up to the equivalent of a full year’s salary in the Belgrade black markets. They were frequently looted together with other valuables from Bosnian homes. 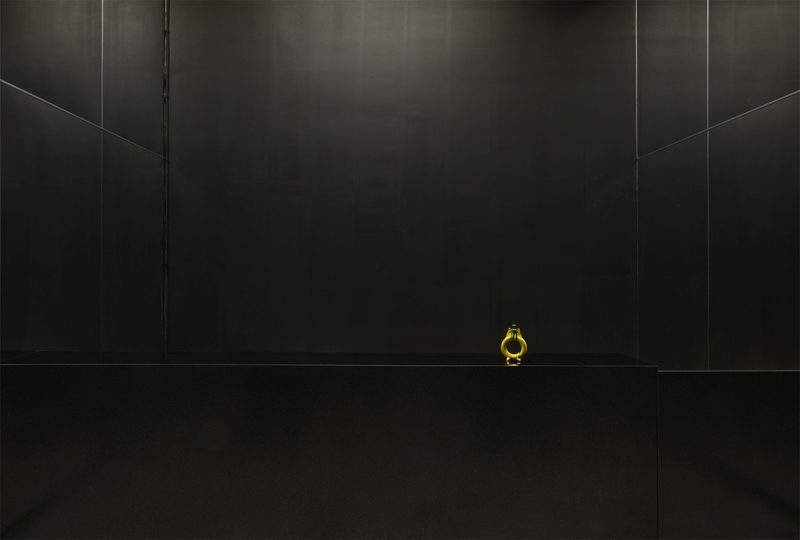 The set exhibited in Seductive Exacting Realism (SER) at the Renaissance Society was seized by local police from Belgrade Kalenić Market in 1995. It was acquired at a public auction in 2014. The set was missing volume number 12. The missing volume was reproduced as the monograph for SER. Means and Ends contains the looted set. At documenta 14 in Kassel, Means and Ends was placed in the Waiting Room of SER and used in the practice of Spinal Discipline. T.V. (Tamni Vilajet), detail, SER Waiting Room, documenta 14, Kassel. 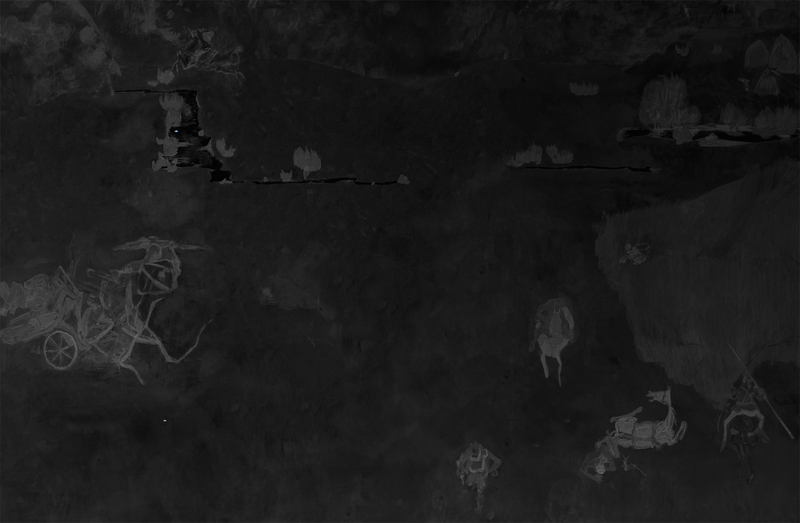 Color pencil on ash inkjet print, 12.5 x 4.2 m.
There is nothing in the Dark Land but pebbles under the soldiers’ feet. Some think: “If I take any, will I regret it?” Others think: “Maybe, maybe I should take just one.” The agony exhausts them, and they sleep. The next day, they awake on the fields by their home city. The soldiers who were holding pebbles are now holding diamonds. They regret taking only one or two. The rest regret not taking any. T.V. (Tamni Vilajet) is an adaptation of Raoul Goldoni’s 1963 mural depicting “the life, suffering and struggle of the people in the region where President Josip Broz Tito was born, from the Middle Ages, until the liberation” at the Museum of Yugoslavia, Belgrade. T.V.’s 17 panels measure 12.5m—the width of the production line of Rheinmetall, one of the largest weapons manufacturers in Europe. The individual panels measure 1.4 m—the width of Yugoexport’s production line. Initially presented at the threshold between the Waiting Room and the Blind Room at documenta 14 in Kassel, T.V. 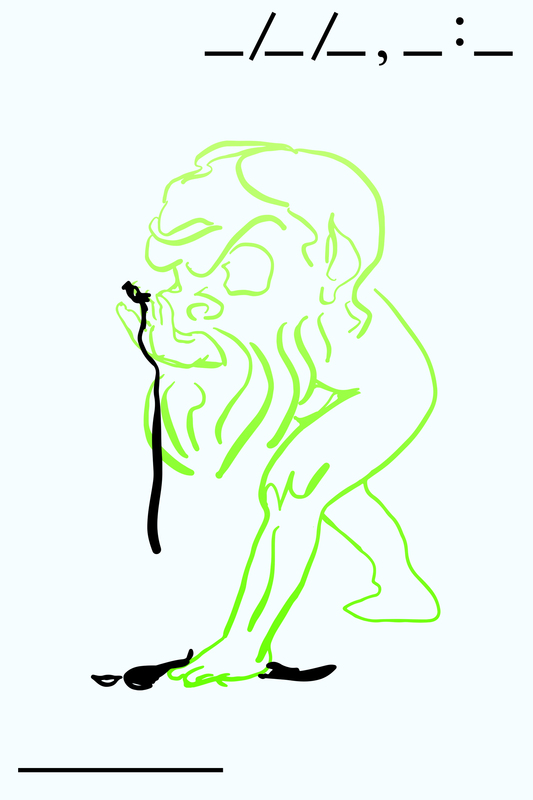 is an oral image of armies lost and people wandering the dark. Special Thanks to Museum of Yugoslavia, Belgrade and Daniel Bauer. Seductive Exacting Realism, Waiting Room, 2015, detail. documenta 14, Kassel, 2017. Photo by Anna Shteynshleyger. This sound program based on an interview Irena Haiduk conducted on January 14, 2015 at Harvard University’s Carpenter Center with Srdja Popovic, co-founder of the OTPOR! student group and the consultancy CANVAS (Center for Applied Non-violent Action and Strategy). SER consists of a Waiting Room and a Blind Room. The edited conversation, re-recorded by Jennifer Estlin and Lin Qian, forms a 28 minute program commencing every hour, on the hour, like a clock in the total dark of the Blind Room. In the dark, the effects of blindness can be felt and the advantages of orality emerge. We cannot immediately tell what is in the room with us and whether it is alive or dead. We come into contact with the features of a thing by testing it before seeing it. The dark establishes an equivalence, a loyalty, and a familial solidarity between people and things. 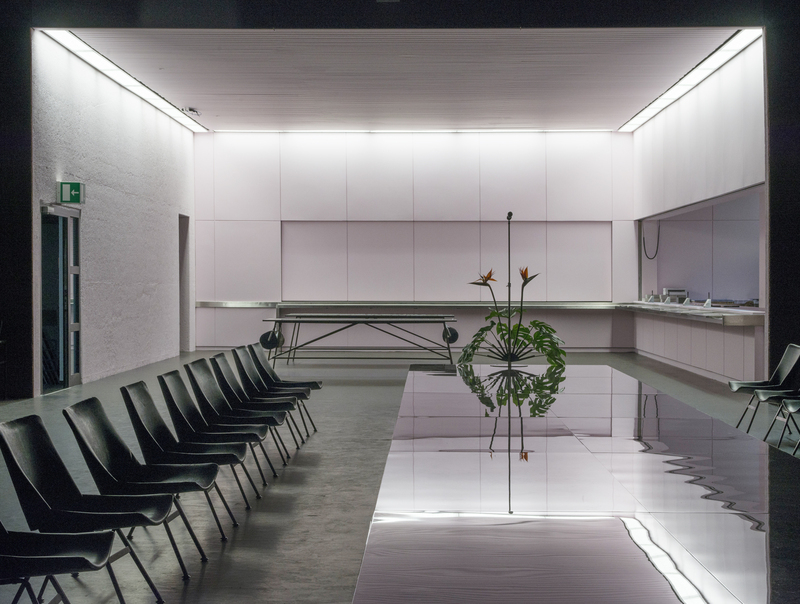 At documenta 14 in Kassel, a Transactional Area preceded the Raiting Room. This economy continues to demonstrate the ongoing incorporation of Yugoexport. Commissioned by the Renaissance Society at The University of Chicago. 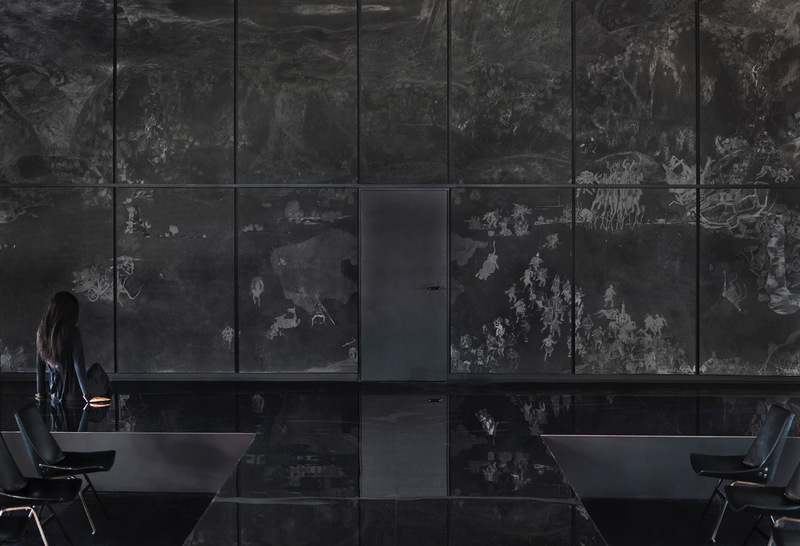 Initially co-presented by the 14th Istanbul Biennial and the Renaissance Society. Nine Hour Delay: Amelia Pool Working, desktop background, 2013. The Borosana shoe was first developed over a nine-year period (1960-69) at Borovo Rubber Industry Headquarters in Vukovar, Yugoslavia. After being designed and tested by the Borovo female workforce and an orthopedic surgeon, the shoe was mandatory for Yugoslav women working in the public sector. Borosana was launched in 1969, in white and navy colors, featuring an ergonomic platform, calculated as ideal for nine hours of standing without hurting the wearer’s spine. In the declining years of Yugoslav communism the model was withdrawn from mass production. Fabrication was abandoned when Vukovar became a war zone in 1991. Each time Nine Hour Delay is exhibited, Borosana becomes the official work shoes of the host institution advancing the constructivist maxim of great utilitarian design in service of the working woman. All those, regardless of gender, seduced by the prospect of wearing ergonomic women’s footwear and employed by the host institution are eligible to receive a pair of Borosana Shoes within the rubric of Nine Hour Delay. The shoe is a clock providing a distinction between labor time and leisure time; by signing form B-02, workers commit themselves to using the shoe in the context of its original making. When the shoes are on, work commences; when the shoes are off, work ends.